Sand filters are an ecological way of treating effluents and are relatively simple and inexpensive. The principle is to percolate the water through a mass of sand. Put simply, the grains of sand form a layer that the water passes through and, through the simple sieve effect will stop the particles that are larger than the intervals between the grains. Smaller particles will also be retained via the wall effect on the surface of the grains is, as they are carried through the filter, they touch a grain. The stopping power of the filter will be higher the lower the diameter of the grains is and the longer the particles spend in the filter. - Rapid sand filters : Rapid sand filters must be cleaned frequently, through backwashing, which entails reversing the direction of the water. The first two require pumps and the use of chemicals (principle of flocculation). A flocculent is used which via a chemical principle will trap matter in suspension and particles and form large flakes which will settle through sedimentation. (Sedimentation means that the particles in suspension stop moving around and settle to the bottom). Contrary to other methods of sand filtering, slow sand filters use biological processes to clean the water, and are non-pressurized systems. They can treat the water and reduce the presence of microorganisms (bacteria, viruses, microbes, etc.) without the need for chemicals. They do not need electricity to run. 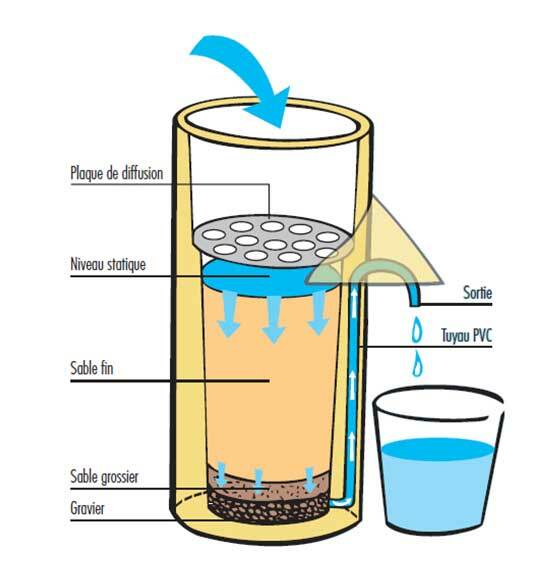 The principle and the operating procedure for sand filters that are used for purposes other than treating water for household use, and in particular for treating wastewater are described in fact sheet A 22 "Treating effluents via sand filtration". Sand filtration is a technology that has been used in water treatment facilities around the world since the 19th century. It is this principle that has been adapted to family water treatment. There are two types of these. This filter is very simple to implement. But alone, it only allows for a basic treatment of the water. 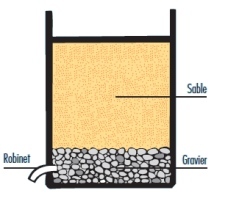 It consists in filling a container, often a simple concrete structure provided with a valve or of a means for emptying, a layer of rather fine gravel and a much more substantial layer of sand onto which the water to be treated is poured which then only needs to be recovered at the bottom of the container. It is really effective when it is used as pre-treatment for other disinfection methods (by solar radiation, chlorination or via boiling) when the raw water available is a little cloudy but is not enough in itself. 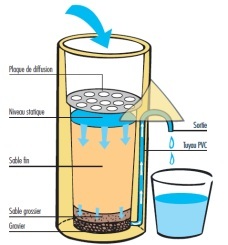 A concrete filter costs between about €10 and €25. Biological sand filters allow for full and highly effective treatment of the water. Thanks to a level of water that is kept constant inside the filter, biological activity forms therein which eliminates the pathogenic germs. The filter is not effective when it is first used as the biological filter has not yet had time to form. The biological layer needs about 3 weeks in order to reach full maturity. The filter has a spreading plate which is used to prevent digging into the sand when the water is poured on. The water flows through the fine sand. 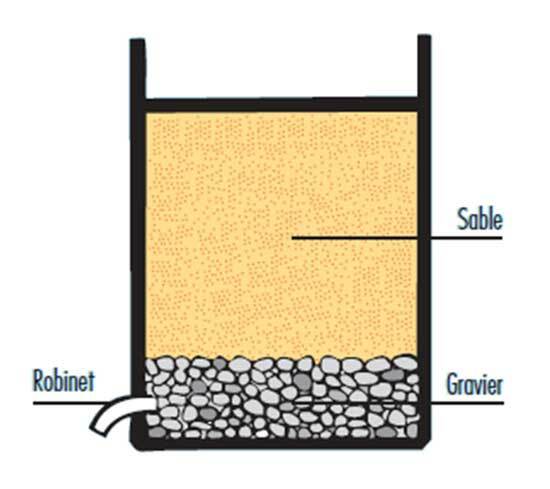 The bottom of the filter is comprised of a layer of course sand and a layer of gravel. A PVC pipe runs up to the level of the top of the layer of sand, in order to keep the level inside the filter constant. The main disadvantage with this filter is that the water flows increasingly slowly as it is used. When the treatment becomes too slow, the sand has to be replaced.